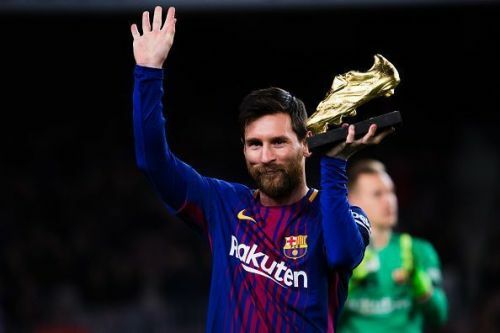 Lionel Messi is on course to win another European Golden Shoe award after his latest hat-trick moved him further clear of rival Cristiano Ronaldo, who didn’t score over the weekend. Messi is currently the reigning holder of the European Golden Shoe award, having won the prestigious prize last season after scoring 34 league goals. The Argentine is, however, closely followed by Ronaldo, who has also won the European Golden Shoe four times. Both players have dominated the award over the last decade and look set to go head-to-head once again this season. Over the weekend, Messi took a giant step to retaining the award after netting an impressive hat-trick against Sevilla. The Argentine had a hand in all of Barcelona’s goals as the Blaugrana came back from behind to beat Sevilla 4-2. Unfortunately, though, Ronaldo could not add to his goal tally over the weekend. Despite Juventus beating Bologna 1-0, it was Paulo Dybala, rather than Ronaldo, who netted the goal. Messi was already topping in the European Golden Shoe race, but has now extended his lead after his latest hat-trick. The Argentine has now scored 25 LaLiga goals, as compared to Ronaldo’s 19 in Serie A. In fact, the Portuguese superstar has even been beaten to second-place by PSG’s Kylian Mbappe, who has scored 22 league goals this season. AC Milan’s Krzysztof Piatek follows with 18 goals, while Edinson Cavani, Sergio Aguero and Mohamed Salah all have 17 league goals. The race for the European Golden Shoe is getting keener but, at this rate, Messi is widening the gap among all his competitors. Messi and Barcelona will turn attention to the Copa del Rey second-leg against Real Madrid at the Bernabeu, while Ronaldo will hope to score when Juventus travel to Napoli in the Serie A.